Behind McDonald’s on Rye Lane lies Holly Grove Shrubbery, a small open green space narrowing to a green linear park lined with vegetation that almost reaches Warwick Gardens to the west. This space also represents the end of a green corridor which stretches all the way from Camberwell, stopping abruptly where it meets with the hustle and bustle of Rye Lane. This strip of greenery acts as a sort of ‘buffer zone’ between the busy shopping street and the residential area just a few hundred yards away. While the linear park further west has recently had some work done to increase visibility and safety the open green space is still in need of some attention. Below are some of the Strengths and Weaknesses of the space identified by EngD student Pola Berent. Pola’s background is in urban planning and regeneration, she is currently doing an engineering doctorate at University College London and Sustrans is her industrial supervisor. This is a Strengths and Weaknesses analysis of the site, which summarises observations and research done by Pola and the project team, with the view to creating an inviting and appealing recreational space. Observations are made from the point of view of an outsider, someone not familiar with the area. 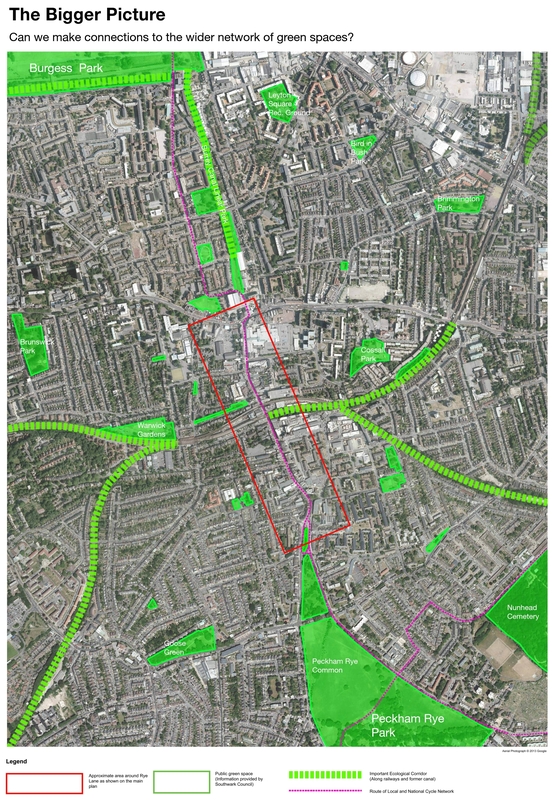 • BUILDINGS HIGHLIGHTED IN GREEN: a mixed surrounding, there are businesses, community facilities, residential houses: a strength in terms of a diversity of community it provides which is crucial to creating dynamic, lively space as well as following the ‘more eyes on the street’ concept it contributes to perception of safety and reduction of crime and anti-social behaviour. • UNDERUSED SPACE: currently underused space with potential. 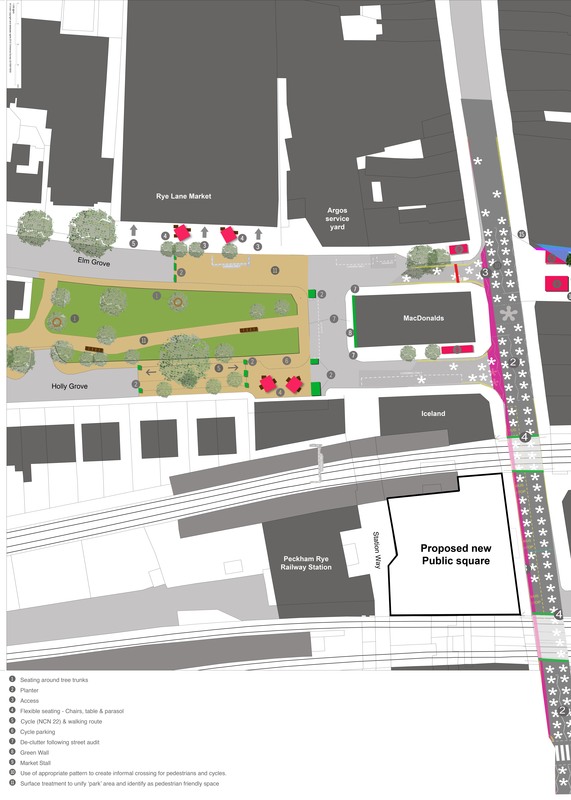 One small space in front of the market and a designated turning space which is a part of the park. • PARK: Green space itself is always a strength when it comes to public spaces. • INFRASTRUCTURE FOR ACTIVE TRAVEL: walking and cycling is much more to scale in this environment and there is a lot of potential for this type of activity to increase in this space. 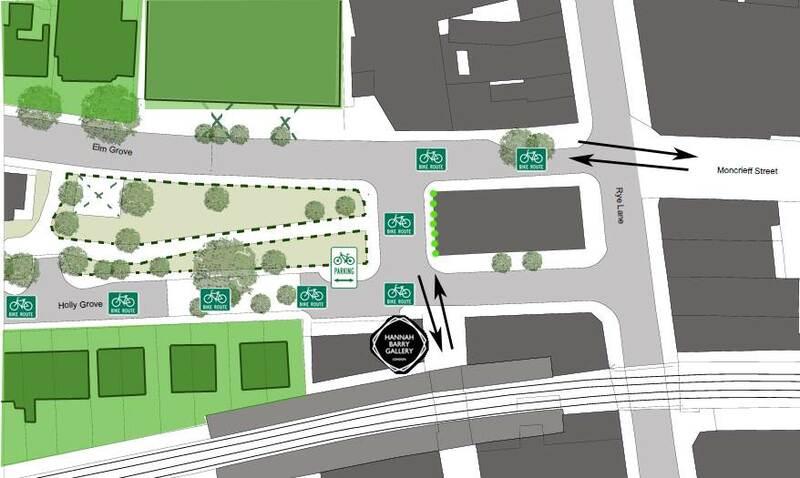 There is already an existing cycling infrastructure: National Cycling Network route, bike parking, and pedestrian paths. • FAÇADE: The back of McDonald’s has a strong bearing on the space and we’ve identified it as a kind of canvas which if utilized properly could strongly impact on the attractiveness of the space. • HANNAH BARRY GALLERY & RYE LANE MARKET: adds to the cultural value of the space and contrasts it with the rougher character of Peckham Rye. • MONCRIEFF PLACE CORRIDOR: There is potential to extend the space in terms of the travelling experience. • NON-ACTIVE FRONTAGES: Limited ‘eyes on the street’ which is directly connected to high crime levels and anti-social behaviour. • HEAVY GOODS VEHICLES: The lorries entering the space and unloading goods is at an intimidating scale, they also increase noise and pollution and cause congestion. The aim is to accommodate both businesses and people, though it seems that at the moment the balance could be looked at again. • MOTORBIKES: Breaking the law using pedestrian and cycle routes, at a speed that is unsafe especially for more vulnerable road users such as children and elderly. • UNDERUSED SPACE: Turning area usually empty or used for illegal parking takes away a significant part of the park. • LITTER: Two spots at the entrances to the space where the litter accumulates. It attracts pigeons, rats, makes the space unattractive and has an impact on the experience of entering the space. • PEOPLE URINATING: Negatively affects the experience of the space making it dirtier and more unpleasant for all the users. • PIGEONS AND PIGEON FEEDING: cause mess, affect airspace,and in big groups they can be very intimidating for pedestrians. • CRIME: Main issues identified; theft, drug dealing and anti-social behaviour. All of the previous weaknesses contribute to it, and it is a weakness that stands out the most. Especially important from the perspective of residents as some of them have children, and often women feel more vulnerable to crime. Since December we have been working closely with residents of Holly Grove and Elm Grove to develop our plans for this area further. 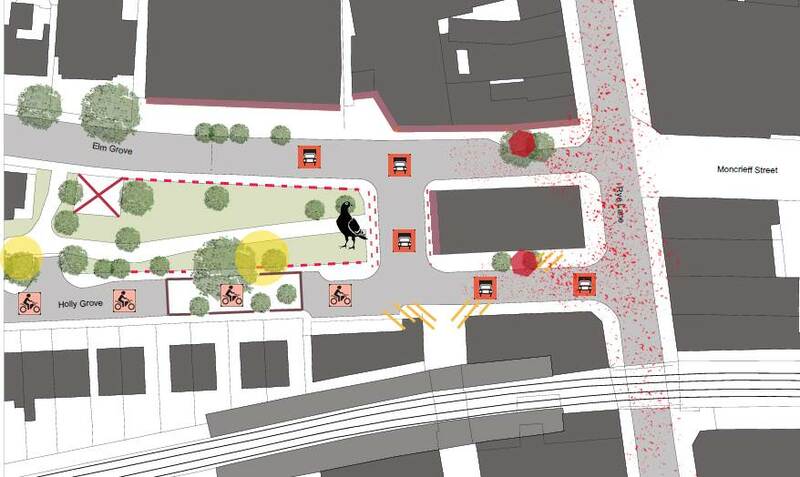 Above is the updated plans for the eastern end of Holly Grove Shrubbery. We hope that by making the place more inviting, with tables and chairs, a green wall, some improved seating and tackling the pigeon problem we can make it a livelier space getting more ‘eyes on the street’. We also want to make it feel like a space for relaxation and calm away from the hustle and bustle of Rye Lane. By removing as many bollards as possible and replacing the essential ones with planters, and by resurfacing the ‘park’ area with a buff coloured grit, we can make this space feel like somewhere you would want to spend some time. We will be seeking out those with an interest in Choumert Car Park and Bournemouth Close next, to develop the current plans for these spaces. If you have an interest in either of these places, please get in touch.